A medium sized frame that draws inspiration from the classic Costa Blackfin, we’ve found the Fantail to be a fantastic blend of form and function. They look great and block out everything we need them to all while we can barely even tell they are on. With eight frame options, and a slew of fantastic lenses to choose from, these glasses can be customized to fit any style, and whether you’re looking for something for every day wear, or something to serve a more specific function, there’s a Fantail option for you. Fun fact: Costa recently released three new sculptures made completely from parts of their products. 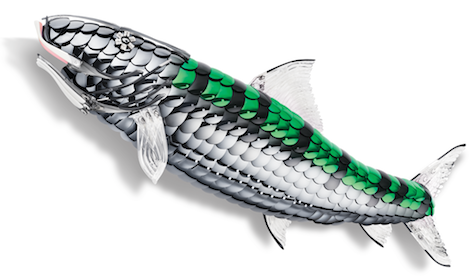 The Bonefish (above) is made from 202 Fantail lenses. Not only is it an incredible piece of art, it’ll also be used to help Costa support various conservation efforts.